Pennsylvania leads the nation in the rate of black homicide victimization according to a new analysis of unpublished Federal Bureau of Investigation (FBI) Supplementary Homicide Report (SHR) data released today by the Violence Policy Center (VPC). 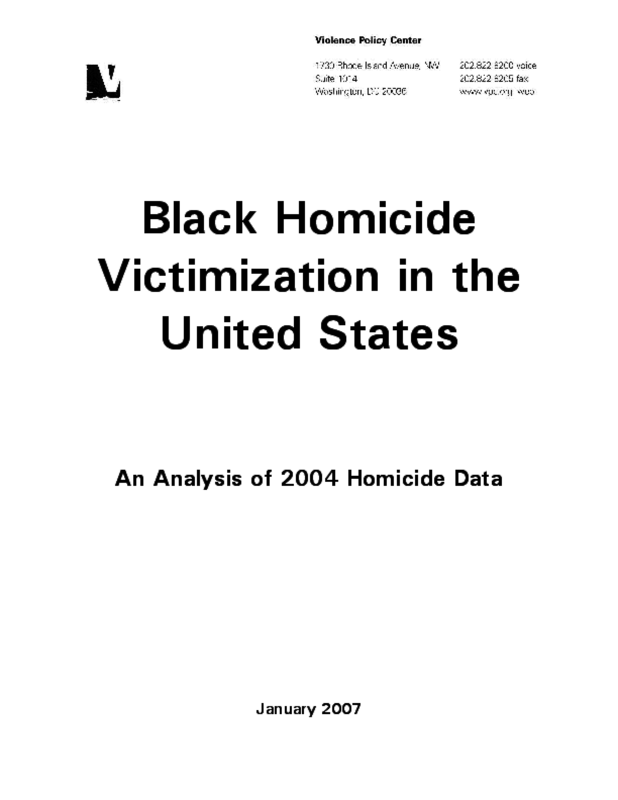 The study, "Black Homicide Victimization in the United States: An Analysis of 2004 Homicide Data", uses 2004 data -- the most recent data available from the FBI -- and is the first analysis to rank the 50 states according to their black homicide rates. The study found overwhelmingly that firearms, usually handguns, were the weapon of choice in the homicides. The top 10 states with each state's corresponding black homicide victimization rates are: 1) Pennsylvania, 29.52 per 100,000; 2) Louisiana, 29.48 per 100,000; 3) Indiana, 29.30 per 100,000; 4) California, 28.95 per 100,000; 5) Missouri, 28.63 per 100,000; 6) Michigan, 28.27 per 100,000; 7) Maryland, 24.64 per 100,000; 8) Minnesota, 24.45 per 100,000; 9) Nevada, 23.67 per 100,000; and, 10) Arizona, 21.54 per 100,000. The study warns that "the toll that homicide exacts on black teens and young adults in America, both male and female, is disproportionate, disturbing, and undeniable" and concludes, "As efforts are made to reduce America's black homicide victimization toll, the unique facilitating role of firearms cannot be ignored."